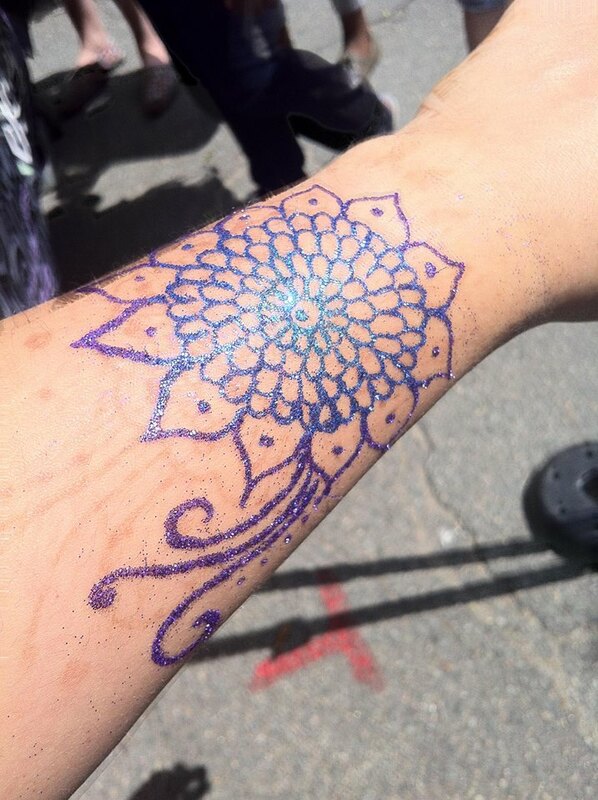 The newest craze in glitter tattoos: the art pen! For those of you who may not have heard, this is the newest way of applying glitter tattoo glue without using a stencil to create a freehand shimmer tattoo. It’s really simple to use! The glitter tattoo glue comes out of the pen through a small opening much like ink would come out of a regular pen. If you’d rather brush on your glitter tattoo glue, there is also a fine tipped brush included. Create swirls, dots and lines easily by gently squeezing the body of the pen. Once your glitter tattoo glue has dried to transparent, you can make your tattoo shimmer by brushing or poofing on Ybody glitter. If you have not tried the glitter tattoo art pen to create beautiful freehand shimmer tattoos – what are you waiting for? This has been all the talk on the glitter tattoo forums, and it’s a great way to flex your creativity muscles while applying gorgeous shimmer designs. Even those of you who have already taken the plunge and gotten yourself a glitter tattoo art pen may still have some questions. Is this going to replace my need for glitter tattoo stencils? Can I use Ybody Colorini in my art pen? What is the best glitter tattoo glue to use? If you are doing a large event or birthday party where you need to apply glitter tattoos to a large number of clients, stencils are going to be the way to go. For a smaller party, or one where you have plenty of time, break out the glitter tattoo art pen, and give each client their own unique freehand shimmer design! YES! YBody Colorini works beautifully in the art pen. The only piece of advice we would offer is not to store the Colorini in the art pens for too long. Only add a small amount of Ybody Colorini to your pen at a time, so that it does not dry out in your pen. Click here to see a tutorial using Colorini in the art pens! We believe that Ybody Pink glue is the best suited for the glitter tattoo art pen. It is thin enough to run smoothly from the tip without getting clogged. Plus, (in case you didn’t know) it is FDA registered, and has been successfully tested by the European Health Administration. Click here to see a tutorial using the Pink Glue in the art pens! Again, since Ybody is now only selling the nail art pens empty we caution you to only fill with the amount you are planning on using. Do not store your glue in the pen, as it is not air-tight and will dry out. This pen has a small red cap (with the nail) and a bigger cap. As I see, they fit very tight. Why isn't the pen air-tight? Well, a great tool. After 3 days the glue did not dry out in it. I think, it is air-tight in reality.